After several quiet years, weather forecasters think we might be entering a more active hurricane season. Prior to 2016, Florida had gone a record ten years without a hurricane making landfall that is until Hurricane Hermine hit Apalachee Bay in the Panhandle. Though the official hurricane season runs from June to November, it is not uncommon for storms to form before the start of the season, in April/May, or well beyond the end of the season right through to the following January. In 2012 both Alberto and Beryl formed in May and in 2015 Ana also formed in May. In 2016 Alex formed in January and Bonnie in May. In 2017, Arlene formed in April and in 2018, another storm called Alberto formed in late May. August and September are traditionally the most active months. The team led by Philip J. Klotzbach from the Department of Atmospheric Science at Colorado State University normally make their first predictions in April/May time but for the 2019 hurricane season they have published a very early forecast. They are anticipating a lower probability of major storm activity unlike the previous three years. This is due to their prediction of the reduced likelihood of El Niño developing and they have put forward five different scenarios with percentage probabilities. Of the five scenarios, the one with the highest percentage forecasts 8 to 11 named storms, 3 to 5 hurricanes of which 1 to 2 could be major hurricanes. Their first quantitive forecast will be on April 4. The National Oceanic and Atmospheric Administration (NOAA) usually put out their first predictions towards the end of May each year with a revised forecast in August. AccuWeather.com normally produce their forecast around the middle of May. 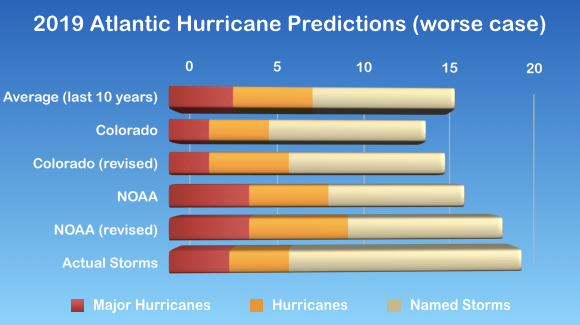 Both the National Oceanic and Atmospheric Administration and the Department of Atmospheric Science at Colorado State University team have often over estimated named storms and hurricanes in recent years but remember these are just predictions. It only takes one storm to do untold damage, just remember Andrew in 1992 or Katrina and Sandy more recently. 2017 ended up being far worse than anybody predicted. In 1992 there were only seven named storms making it a “quiet” year but the first storm of the season, the category 5 Hurricane Andrew, hit Homestead near Miami before crossing over into the Gulf and onto Louisiana. Damage was estimated at $26 billion with around 65 people killed in total. Each year a set of names alternating between boys and girls is chosen for all named storms. Names are often re-used but the names of particularly damaging hurricanes such as Katrina and Sandy are withdrawn and never used again.